M Tamim, N Erdil, U Demirkilic, L Cetin, E Sener, H Tatar. The Response to Antiarrhythmia Therapy with Amiodarone in Diabetic Patients Undergoing Coronary Artery Bypass Grafting. The Internet Journal of Cardiology. 2001 Volume 1 Number 2. Background: The immediate response obtained following intravenous amiodarone administration, has made amiodarone to be the first choice for arrhythmia treatment occurring after coronary artery bypass grafting. However, whether the response is the same with all the patients undergoing coronary artery bypass grafting is unknown. Methods: We investigated the response to amiodarone therapy in diabetic and nondiabetic patients who developed arrhythmia after coronary artery bypass grafting operation. The response to amiodarone therapy in 25 Type II (noninsulin-depending) diabetic patients was compared with that in 25 non-diabetic patients (i.e. controls). Results: In the diabetic group, atrial fibrillation was observed in 19 patients, and premature ventricular contractions and supraventricular tachycardia were observed in 4 and 2 patients, retrospectively. Atrial fibrillation and premature ventricular contractions were observed in 21 and 4 patients in the control group. In case of arrhythmia, the mean heart rate was 140.92±21.73 beats/min and 141.16±20.31 beats/min in diabetic patients, and the control group, respectively. Upon intravenous amiodarone administration, the mean heart rate was decreased to 87.04±6.11 beats/min in diabetic patients and to 85.92±6.86 beats/min in the control group. The mean response time to the amiodarone therapy was statistically significantly different in diabetic patients (20.8±16.95 hours) when compared with the response time in the control group (7.2±2.39 hours) (p<0.05). Conclusion: The response to amiodarone therapy for arrhythmia was found to be delayed in diabetic patients compared with that in non-diabetic patients undergoing coronary artery bypass grafting operation. Amiodarone is a potent class III antiarrhythmic agent approved for treatment of recalcitrant ventricular arrhythmias. It is an amphiphilic-iodinated organic compound with a prolonged elimination rate. Amiodarone is used for treatment of ventricular and supraventricular cardiac arrhythmias , for the prevention of atrial fibrillation (AF) which occur after coronary artery bypass grafting (CABG) [2,3]. Amiodarone can also be used in patients with myocardial infarction to prevent sudden death because of ventricular arrhythmia . Despite its various adverse effects like hypothyroidism, hyperthyroidism and elevation of serum cholesterol and triglyceride levels, the drug was reported to have a good result in arrhythmia management occurring after coronary artery bypass operations [2,5,6]. The aim of this study is to evaluate the response to amiodarone administration in diabetic and non-diabetic patients undergoing CABG, submitted to the same dosage of amiodarone. The patients undergoing coronary artery bypass grafting operation who developed postoperative arrhythmia were included in this study and intravenous amiodarone therapy was administered to selected diabetic and nondiabetic patients. All patients were in the normal sinus rhythm preoperatively and underwent elective coronary artery bypass surgery. Patients with emergency or urgent surgery were excluded from the study. Twenty-five diabetic patients (mean age 61.72 4.72 years) and 25 non-diabetic patients (mean age 61.24 8.91 years) were studied (Table 1). All diabetic patients had ype II (noninsulin-dependent) diabetic mellitus with no signs of peripheral neuropathy. All diabetic patients were treated with diet and oral hypoglycemic agents and had an acceptable glycemic control, with overnight fasting blood sugar levels of 180 mg/100ml. Patients with less than 30% ejection fraction, uncontrolled atrial fibrillation, atrial flutter or premature ventricular contractions (PVCs) were excluded from the study. Also, presence of type II or III atrioventricular block, right or left bundle branch block, severe organ disease, treatment with digoxin, beta-adrenergic blocking drugs or usage of any other antiarrhythmic agents and presence of valvular heart disease were used as criteria for exclusion from the study. The same surgical team made all operations. All of the patients were operated by using non-pulsatile bypass circuits and membrane oxygenation (Dideco, D-708, Simplex, Mirandola, Italy). Myocardial preservation was applied to all patients with combination of moderate systemic and topical hypothermia, cold crystalloid cardioplegia and warm re-perfusion. Three chest leads were connected to an oscilloscope and the instantaneous heart rate was continuously monitored in the intensive care unit. We did not use digital postoperatively due to interaction with amiodarone. Beta-blockers were not used in the early postoperative period because of their preventive effect of supraventricular tachyarrhythmias. The treatment protocol was intravenous amiodarone infusion of 300 mg/60min, followed by 900-mg/24 hour and antiarrhythmic therapy was continued by 300 mg/day p.o. in two equally divided doses. Amiodarone therapy was reduced to 150 mg/day in the postoperative 15th day, and stopped at the end of the first month. A stable conversion to normal sinus rhythm of atrial fibrillation, atrial flatter, supraventricular tachycardia (SVT) confirmed by 48 hours monitoring was considered as a positive response to drug therapy. Onset of postoperative arrhythmia, heart rate before and after arrhythmia episode, and the time needed for conversion from arrhythmia to normal sinus rhythm were recorded by nursing staff throughout the study period. Data and risk assessment profiles were completed retrospectively for each patient and compared the diabetic versus non-diabetic patients. Results were expressed as the mean standard deviation. The Student's t-test and Chi-square test were used for continuous and categorical variables, respectively. P values of less than 0.05 were considered as statistically significant. 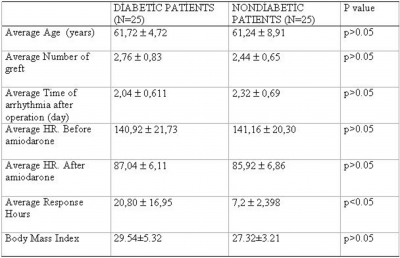 As summarized in Table 2, there was no statistically significant difference between diabetic and nondiabetic patients for age (61.72 4.72 years vs 61.24 8.91 years), graft numbers (2.76 0.83 vs 2.44 0.65) and postoperative arrhythmia appearance time (2.04 0.6 day vs 2.32 0.6 day) (p 0.05). Perioperative myocardial infarction was not developed in any patient. Arrhythmia types recorded in the diabetic patient group were atrial fibrillation, PVCs, and SVT in 19, 4, and 2 patients, retrospectively. 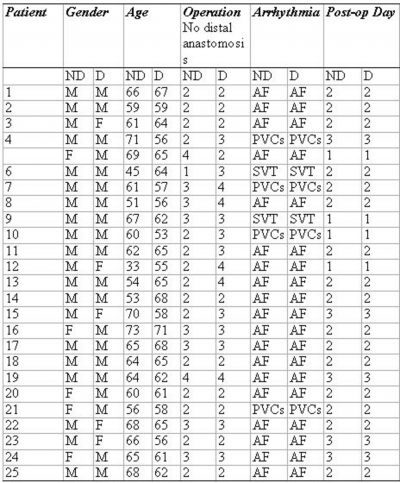 In nondiabetic patient group, atrial fibrillation was recorded in 21 patients and PVCs were observed in 4 patients. Two groups were similar with respect of arrhythmia types (p 0.05). As seen in Figure 1, the mean heart rate before amiodarone administration was 140.92 21.73 beats/min in the diabetic group and 141.16 20.30 beats/min in the nondiabetic group, and was not significamt statistically (p 0.05). Similarly, the mean heart rate after amiodarone administration was 87.04 6.11 beats/min in the diabetic group and 85.92 6.86 beats/min in the non-diabetic group with no statistically significant difference between the groups (p 0.05). There was a significant difference between the diabetic group and nondiabetic group in regarding the time needed to convert the arrhythmia to normal sinus rhythm after amiodarone administration (20.8 16.95 hours in diabetics and 7.2 2.39 hours in nondiabetics) (p 0.05) (Figure 1). All the patients had normal sinus rhythm at discharge, i.e., on the fifth postoperative day. Amiodarone therapy was gradually reduced and stopped in the first postoperative month and we did not observe any amiodarone induced thyroid-related complications. D= Diabetic; ND= Non-diabetic; CABG= Coronary artery bypass grafting; AF= atrial fibrillation; PVCs= Premature ventricular contractions; SVT= Supraventricular tachycardia. The incidence of cardiac arrhythmia after CABG can reach up to  and can increase the postoperative morbidity, mortality, hospital stay, and cost [2,7,8]. Early management of cardiac arrhythmia developing after cardiac operations with antiarrhythmic agents was well investigated [2,3,8,9] and previous studies have shown a positive response of amiodarone therapy when used for atrial fibrillation in patients undergoing CABG. Amiodarone has slowed down the ventricular response in atrial fibrillation or flutter by its depressive effects on the atrioventricular node function, due to its noncompetitive adrenergic antagonism. Amiodarone has originally been described to prolong repolarization in atrial and ventricular muscle fibers and thereby to possess a class III action. Recent studies have shown the positive response of amiodarone therapy in chronic or paroxysmal atrial fibrillation [10,11,12,13,14]. It is well known that diabetic patients frequently show a perturbed autonomic regulation of the cardiovascular system due to autonomic neuropathy. The majority of diabetic patients have parasympathetic dysfunction, which expresses an increased resting heart rate up to approximately 90 beats per minute, called “fixed heart rate”. The irresponsiveness to exercise or stress fixed heart rate considers the extreme end of the cardiac autonomic dysfunction in diabetic patients . A study done by Lervasi et al. has demonstrated that the use of intravenous amiodarone loading dose in diabetic patients with cardiac arrhythmia has a later decrease in heart rate (after 4 days from the start of treatment) with a later antiarrhythmic positive response when compared with the results with nondiabetic arrhythmic patients who have a very early decrease in heart rate (within 4 hours after the start of treatment), and also an early antiarrhythmic positive response (on average within 7 hours) . In our study, we have observed patientsa decrease in the mean heart rate after amiodarone administration down to 87.04 6.11 beats/min in the diabetic patient group, and 85.92 6.86 beats/min in the non-diabetic patient group (p 0.05). These findings show that all patients are responding well to amiodarone treatment. Treatment with amiodarone succeeded in converting the cardiac arrhythmia to normal sinus rhythm in all nondiabetic patients (after 7.2 2.39 hours); the same success is seen in diabetic group, but appeared lately (after 20.8 16.95 hours). These data suggest a less pronounced sympatholytic effect of amiodarone treatment in diabetic patients undergoing CABG when compared with non-diabetic patients undergoing the same operation. The side effects of amiodarone are well known, and largely depend on dosage, patient population and the length of follow-up, etc. Gold et al. has reported that the patients treated with amiodarone have side effects including comprised central nervous system symptoms, thyroid dysfunction, sun sensitivity, gastrointestinal side effects and others . In our study we did not detect any side effect of amiodarone in the dosage used for the treatment of arrhythmia. In conclusion, our study suggests that the treatment of the cardiac arrhythmia developed after CABG with amiodarone has a different positive response on diabetic and non-diabetic patients. Thedelayed response in diabetic patients may be due to autonomic neuropathy. We recommend that the amiodarone loading dose could be modified when amiodarone is used to treat arrhythmia in diabetic patients undergoing CABG. Further research in this area is clearly warranted. 1. Naccarelli GV, Jalal S. Intravenous amiodarone. Another option in the acute management of sustained ventricular tachyarrhythmias. Circulation 1995;92:3154-9. 2. Redle JD, Khurana S, Marzan R, et al. Prophylactic oral amiodarone compared with placebo for prevention of atrial fibrillation after coronary artery bypass surgery. Am Heart J 1999;138:144-50. 3. Zaman AG, Archbold A, Alamgir F. Amiodarone prophylaxis for atrial fibrillation after cardiac surgery. N Engl J Med 1998;338:1383-4. 4. Ceremuzynski L. Secondary prevention after myocardial infarction with class III antiarrhythmic drugs. Am J Cardiol 1993;72:82-6. 5. Trip MD & Wiersinga WM. Incidence, predictability, and pathogenesis of amiodarone-induced thyrotoxicosis and hyperthyroidism. Am .J. Med 1991;91:507-511. 6. Pollk PT, Sharma AD, Carruthers SG. Elevation of serum total cholesterol and triglyceride levels during amiodarone therapy. Am J Cardiol 1988;62:562-5. 7. Krohn BG, Kay JH, Mendez MA, et al. Rapid sustained recovery after cardiac operations. J Thorac Cardiovasc Surg 1990;100:194-7. 8. Olshansky B. Management of atrial fibrillation after coronary artery bypass grafting. Am J Cardiol 1996;78: 27-34. 9. Yilmaz AT, Demirkilic U, Arslan M, et al. Long-term prevention of atrial fibrillation after coronary artery bypass surgery; comparison of quinidine, verapamil, and amiodarone in maintaining sinus rhythm. J Card Surg 1996;11(1):61-4. 10. Graboyes TB, Podrid PJ, Lown B. Efficacy of amiodarone for refractory supraventricular tachyarrhythmias. Am Heart J 1983;106:870-5. 11. Horomitz LN, Spielman SR, Greenspan AM . Use of amiodarone in the treatment of persistent and paroxysmal atrial fibrillation resistant to quinidine therapy. J Am Coll Cardiol 1985;6:1402-6. 12. Vitolo E, Tronci M, Laravere MT. Amiodarone versus quinidine in the prophylaxis of atrial fibrillation. Acta Cardiol 1981;36:431-7. 13. Gold RL, Haffajee CL, Charos G. Amiodarone for refractory atrial fibrillation. Am J Cardiol 1986;7:124-8. 14. Du XJ, Esler MD, Dart AM. Sympatholytic action of intravenous amiodarone in the rat heart. Circulation 1995;91(2):462-8. 15. Kadish AH, Chen RF, Schmaltz S, et al. Magnitude and time course of -adrenergic antagonism during oral amiodarone therapy. J Am Coll Cardiol 1990;16:1240-9. 16. Lervasi G, Clerico A, Bonini R, et al. Effect of antiarrhythmic therapy with intravenous loading dose of amiodarone: evidence for altered response in diabetic patients. Int J Clin Pharm Res 1998;18(3):109-120.